Welcome to the official Survival server for the Magic plugin by elMakers! Log in and play at mine.elmakers.com. You may also view our dynmap here. Magic is a plugin for the Bukkit minecraft server, you can find development builds on our Jenkins CI Server. In order to cast spells, you must obtain a wand. Each wand is unique and knows one or more spells. Wands can also be imbued with special properties and materials. 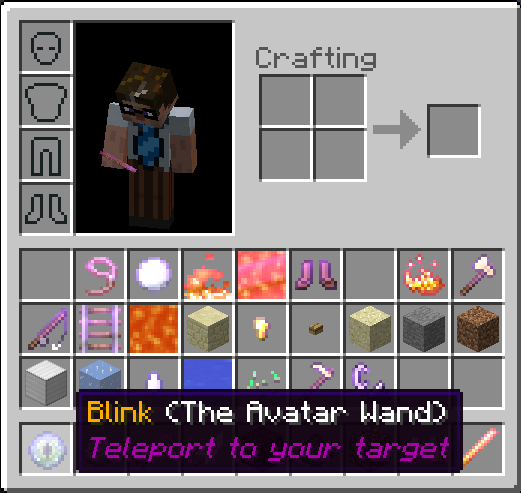 There are also 69 wand templates, which may be purchasable or given my admins. Wands contain one or more spells in their inventory. Wands may generally know any spell, though some wands may only naturally obtain certain spells via enchanting. There are currently 205 spells available. A wand is considered "active" when you are holding it. Any special effects a wand gives are only applied while the wand is active. Swing a wand (left-click) to cast its active spell. Some wands may have more than one spell. If a wand has multiple spells, you use the interact (right-click) action to select spells. In the default mode, right-clicking with your wand will pop up a chest inventory. Click on a spell icon to activate it. If your wand has a lot of spells, click outside of the inventory window to move to the next page. Right-click outside of the inventory to move back a page. With the wand inventory active, each spell is represented by an icon. You can quickly change spells using the hotbar buttons (1-9). While in this view, you can re-arrange your spells and materials, deciding which ones to put in the hotbar. Right-click again to deactivate the wand inventory and restore your items. Any items you collected while the wand inventory was active will be in your survival inventory. For wands with more than 35 spells, clicking outside of the inventory will cycle to the next "page" of spells. Right-clicking outside of the inventory will go to the previous page. Renaming a wand on an anvil will organize its inventory, should it get too cluttered. A spell or material can be quick-selected from an open wand inventory using right-click. This mode only works well with low-powered wands, ones that only have a few spells. In this mode you right-click to cycle through available spells- there is no menu, and no icons. Casting costs vary by spell, wand, and server configuration. The most common setup is the "mana" system. In this mode, each wand has a mana pool that regenerates over time. While a wand is active, your mana is represented by the XP bar. (Your gathered XP will be saved and restored when the wand deactivates). Other configurations could range from consuming actual XP, reagent items, or just being free. Some wands may also have a limited number of uses, after which time they will self-destruct. Select a spell for details. Select a recipe for details. Select an enchanting path for details. Select a wand for details. Select an item for details. There are 252 spell icons available in the Magic RP, each is a variant of the diamond axe item. Legacy configs use player skulls for icons, here are 266 that have been made or chosen specifically for Magic.